Signed: Case, dial, movement and bracelet signed; case with limited edition number 236. While July 20th 1969 is remembered in the global historical record as the day man first walked on the moon, it is treasured by Omega in particular as Apollo XI astronauts Buzz Aldrin and Neil Armstrong both wore Omega Speedmasters to accompany their historic moonwalk. “To mark man’s conquest of space with time, through time, on time” adorns the casebacks of the first 32 pieces of this limited edition series of 1,014 Speedmasters, resplendent in 18K yellow gold with a matching bracelet and burgundy bezel. These first few watches were awarded to the President and Vice-President of the United States at the time (who eventually did not accept the gift due to compliance reasons), then watches numbered 3 through 28 were presented to NASA astronauts, with 29 through 32 going to important members of Omega and Lemania – all with their names engraved in the caseback. 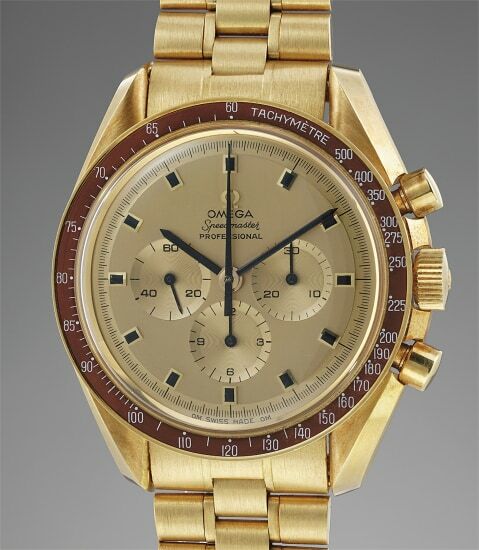 The present lot is part of the first batch offered publicly in 1969, numbers 33 through 1,000, bearing the inscription "The First Watch Worn on the Moon" along with the limited edition number. It is accompanied by its original hang tag and presentation box, the latter of which has a distinct texture evoking the lunar surface. Few examples of the box have survived to the present day, making it a highly rare collector’s item. Case, dial, movement and bracelet signed; case with limited edition number 236.